Tired of waiting in the line at railway stations to get your train tickets to your favourite destination or to meet your family? Even tatkal tickets are not coming through during peak vacation time? Then try Redbus today. This is the best to book if you are a frequent traveler and who is also looking at an economical way to travelling around. Redbus gives you the best way book your bus tickets - just go to the site or download Redbus app and start booking. It is present in almost all major metro cities and there is also a bus that goes to remote villages that you usually wouldn't find when booking a train ticket. So fret no more and book easily at Redbus whenever you want and you can also enjoy regular Promo codes. redBus Early Bird Sale is here! Book buses online at redBus and get upto Rs 125 off on each bus ticket. Here you can also get extra 5% cashback upto Rs 250 on HDFC bank payments. Apply coupon on your checkout page to get this offer. This redBus early bird coupon is valid only for date of journey between 11th Aug to 15th Aug. Hurry up and book your tickets now! Get 10% discount (max. Rs 100) on your booking. EXTRA up to 10% cashback from your favorite bus operators using Red Deals. Red Deals are operator specific discounts which are available on certain routes for redBus users exclusively. No offer code is required to avail these offers. redBus offer is applicable for a minimum ticket value of Rs 300.
redBus offer is valid only for logged-in users who verify their mobile number with OTP (one time password). redBus offer is available only on mobile web, Desktop and Apps. Check more details at landing page. Get now! Get 30% upto Rs 300 discount. Offer only available on Apps to first time users of redBus. Offer is applicable for a minimum ticket value of Rs 400. Offer is applicable once per customer email or mobile number. This redBus offer is valid only for logged-in users who verify their mobile number with OTP (one time password). Valid on all bus ticket bookings. Get flat 10% cashback on bus bookings online at redBus. Here you can get upto Rs 40 on your bus tickets. This offer is applicable only on your payments done with FreeCharge wallet. No promo codes required. Hurry up and avail now! Get Rs.1000 discount on any booking with Base Fare above Rs.20000. redBus offer is applicable twice per customer email or mobile number. redBus offer is applicable on Full Payment and Partial Payment options only. In case of Partial payment, the discount will be offered on the first payment being made. redBus offer is available only on mobile web, Desktop and Apps. Check more details at landing page. Book now! redBus offers flat Rs 500 discount on any booking with Base Fare above Rs 10000. redBus offer is applicable twice per customer email or mobile number. redBus offer is applicable on Full Payment and Partial Payment options only. In case of Partial payment, the discount will be offered on the first payment being made. redBus offer is available only on mobile web, Desktop and Apps. Check more details at landing page. Get Rs.200 discount on Bus Hire Booking. redBus offer is applicable twice per customer email or mobile number. redBus offer is applicable on Full Payment and Partial Payment options only. In case of Partial payment, the discount will be offered on the first payment being made. redBus offer is available only on mobile web, Desktop and Apps. Check more details at landing page. Apply coupon code at check out page to get discount. Avail now! What is Free cancellation policy? During the booking process, select a bus with Free Cancellation option & enjoy ZERO penalty in case you wish to cancel the booking. Book and get flat 15% upto Rs 100 discount for bookings made on APSRTC. This offer is applicable for a minimum ticket value of Rs 200. This offer is valid only for logged-in users who verify their mobile number with OTP (one time password). This offer is applicable once per customer email or mobile number. This offer is available only on Mobile Web, Desktop and Apps. Book your bus tickets online at redBus and avail flat 20% off. Offer valid only on payments done via ICICI bank debit or credit cards. No minimum booking value required to get this offer. Here you can get maximum discount of Rs 100. Applicable for both old and new users. Hurry up and book now! Book bus tickets online at redBus and get upto Rs 300 Off. Offer applicable on all bus routes. Apply coupon on your checkout page to get this offer. This exclusive redBus coupon is valid for all users on minimum ticket value of Rs 300. No other codes can be clubbed with this deal. Hurry up and book now. Book hotels online at redBus and avail flat 60% off on minimum transaction of Rs 750. Apply coupon on your checkout page to get this discount offer. This redBus hotel coupon is valid only for new users. No other codes can be combined with this deal. Hurry up and book now! Book Tirupati hotel rooms online at redBus and get free Tirupati darshan tickets on your bookings. This offer is applicable for all users. Apply coupon on your bookings and avail now. Book your bus tickets online at redBus and avail flat 15% off. Offer valid only on payments done via ICICI bank debit or credit cards. The minimum booking value required is Rs 300 to claim this offer. Here you can get minimum discount of Rs 100. Applicable for both old and new users. Hurry up and book now! Get upto 70% off on hotel bookings online at redBus. Here you can get maximum of Rs 4000 discount on all hotel room bookings across the India. Apply coupon on your payments and get the discount now. Hurry up and book now! Book bus tickets online at redBus and avail flat 15% off + extra 5% cashback on HDFC bank payments. Here minimum discount you can get is Rs 250. Minimum booking value required to avail this offer is Rs 300. No coupons required to get this offer. Hurry up and avail now! Book and get flat 25% off on all pilgrimage tours and travel packages online at redBus. Choose different packages which includes darshan onward and return bus, room on arrival, meals, pick up and drop, pooja options and more. No coupon code required to get this discount offer. Hurry up and book now! Now refer your family and friends to earn exciting rewards at redBus. As soon as your friend signs-up on the redBus Android or iOS app using your referral code/link, they can apply offer code FIRST and get 15% upto Rs 200 discount on their first bus booking(min transaction value Rs 400) on redBus. You will get Rs 100 in your redBus Wallet after your friend completes their first trip (with minimum transaction value Rs 400) with redBus. You can see your referral code and link under the ‘Refer & Earn’ option in the left side hamburger menu. Verified on 22/4/2019 .. Redbus brings to you exclusive offers today on APSRTC travel. Make your travel more comfortable and also budget friendly with the deals present on Redbus. Book your bus ticket and get the lowest possible fare online. No offer code is required to avail this offer. Verified on 22/4/2019 .. Get upto 80% off (max discount of Rs 4000) on hotel bookings. Offer is available to all customers who have booked bus tickets on redBus after 31st Dec 2015. This discount is applicable only on base fare of hotels. The bus ticket number (TIN / Ticket no.) can be used as the offer code during hotel booking. A bus ticket number can be used as offer code only for one transaction of hotel booking. This offer cannot be clubbed with any other offer code on redBus. Your bus ticket number will be the coupon code. Book now! Redbus offers today lowest price on bus ticket for Pune to Bangalore. Avail world class service at lowest cost online. Book now and get the tickets at discounted price only at Redbus. Stay tuned to get latest booking offers on our bus bookings. Redbus mobile app is also available out there. One user download this. It will start pushing notifications on latest offer and discounts. Download the app now be the first to know offers. Avail now! Enjoy best ticket prices at Redbus when you book bus tickets from Bangalore to Hyderabad. They provide luxurious and comfortable travel at affordable cost. Do not miss out this exclusive offer. No coupon code is required. Stay tuned to get latest Redbus offer codes on bus tickets to save big on your bookings. Redbus offers best price on bus tickets from Hyderabad to Chennai. They provide luxurious and comfortable travel at minimum cost. Book your bus tickets and get the best service and an hassle free payment facility. Redbus is pioneer in providing bus ticket for the lowest cost online. No offer codes required to grab this offer. Book now! Redbus is offering bus ticket offers for Chennai to Coimbatore , prices starting at Rs 600 . Choose from different travel operators. No coupon code required to avail this best price offer. Redbus is offering bus ticket offers for Hyderabad to Bangalore , prices starting at Rs 444. Choose from different travel operators. No coupon code required to get this dicount price offer. Hurry up and book now. Verified on 22/4/2019 .. Book your bus tickets for Chennai to Madurai at unbelievable cost only at Redbus. Ticket prices starting at Rs 499 only. Choose from different travels like National travels, Bethlehem Transports,Amarnath Travels, Madurai Balajee Tours Travels and more. This is valid for both old and new users of Redbus. Book now and get this instant cashback on your bus booking for this route. No coupon code required. Book now! Verified on 22/4/2019 .. Book your bus tickets at Redbus to get the lowest fares online compare to others. Book your bus ticket from Hyderabad to Pune ticket starting at Rs 699. No coupon code required, choose from different bus operators. Book and avail now!! Bus cancellation price details and terms .On Time Guarantee is applicable only for participating operators. 25 % penalty in case of a delay beyond 30 min from 1st BP departure .Bus cancellation - 150% if no alternative provided. Bus cancellation - 25% + Fare difference if inferior quality bus provided by the operator. Bus cancellation - 25% if the departure is beyond 30 Mins of original departure. 300 % penalty if a bus breakdown and no alternative provided within 6 hours. Follow landing page to get more info about cancellations. Avail now! Mumbai to Pune Open Ticket at Rs. 299. Customer should book the seat on "Purple - Exclusive redbus". If you miss this bus, you can get on any Purple - Exclusive redBus bus throughout the day. No offer code is required to avail this offer. Available on mobile web, Desktop and Apps. This ticket is not cancelled. Avail now. Book your bus tickets online at redBus and get flat 5% cashback. Minimum transaction value is Rs 1000 and above. Here you can get maximum cashback points of Rs 250. Offer applicable for both old and new users. No coupon codes required to get this deal. Valid only on HDFC bank payments. Avail now! Book and get flat Rs 150 off on all bus bookings online at redBus. Here offer is applicable on bus routes. No coupon codes required to get this exclusive offer. Hurry up and avail now! All redBus customers, Get 70% discount on goSTAYS hotel room bookings at redBus. Maximum discount is Rs 500 only. Valid on goSTAY branded rooms only. This is the best offer on the site. Apply coupon code at check out page to get discount. Bookings done using above promo code will be non-refundable. Book now and make big savings. Hurry up!! Redbus is giving away Flat Rs 100 discount on a minimum transaction of Rs 300. Use the coupon code while booking to get the offer. Valid for first time mobile app users only and cannot be clubbed with any other offer. Use the Redbus promo code today to get the discount. Download Redbus Mobile App for your Smart Phone for Free book your bus ticket for Volvo, AC Buses. Redbus app gives your the freedom of booking bus tickets at just one click. Book now!! Get upto Rs 50 cashback max of 1% ticket value when you pay via payumoney wallet at redBus . No coupon code is required to get this offer. Have a affordable journey by making use of this amazing offer. Grab this redbus payumoney offer and make big savings on your bus ticket bookings. Book your ticket and get flat Rs 25 OFF and also get extra upto 20% which is upto Rs 50 when you pay via Freecharge. This Freecharge bus booking offers is applicable for first time users only. Book your ticket and use the exclusive coupon code today at the check out and get the deal. This is the best offer on the site. Make the best discount out of this offer. Book a bus at Redbus and avail Flat Rs 110 OFF on North and East routes . Offer valid on mobile app only. This is applicable for the first time users on Redbus App. This offer can not be combined with any others. Book Your Tickets to any of your favourite cities within India like Delhi, Pune, Gurgaon, Goa, Mumbai and so on. Book your ticket and use the special promo code a the check out to grab this deal. Make the best out of this sale. redBus.in is India’s top platform to book bus tickets. It was founded in 2005 and is a part of the Ibibo Group. You can choose from over 2,000 bus operators and 100,000 plus routes in India. It is a hassle-free service that makes sure you get your ticket, even if it’s the last minute one. redBus has ventured beyond providing services over the net, by reaching out to clients using all media that help them to use their services with ease – like physical outlets, phones, home delivery and even text messages/SMS. They provide a very wide range of buses like A.C. buses, sleeper buses, Volvo and much more. redBus’s dream of making road transport easier and irritation free came from two engineers from BITS Pilani - Phanindra Reddy Sama and Charan Padmaraju who set up their project under the name of redBus 2006. Since then, there has been only looking forward to new goals with redBus growing year after year. It has its offices in Kolkata, Coimbatore, Bangalore, Chennai, Hyderabad, Ahmedabad, Vishakhapatnam, Mumbai, Pune, Vijayawada and even Singapore. Now, redBus is also into the hotel bookings which promised to offer lowest prices without using any redBus discount codes. Travel to the trendiest destination like Bangalore, Goa, Hyderabad, Pune, Chennai, and lot more effortlessly. You can even find the traveler reviews on the page which are verified and helps you to choose the best hotel for the stay. Round the clock customer support is always there to help you out with any issues. redBus has always strived to provide the best service with respect to the bus transportation. People choose this portal for booking travel tickets for the hassle free journey and for a good traveling experience. All you need to do is choose the destination, bus operator, and the feasible timing. That’s it, your bus ticket booking is done. Once you have boarded the bus also, the travel route can be tracked and can even share the tracking details with dear ones in case of emergency. If you are in doubt that which bus operator is good, then you can go through the reviews which are shared by other users that might help you. redBus mobile app is designed to make the booking much easier and much faster. redBus mobile offers allow you to book tickets for much lesser price than the normal pricing. redBus has had tremendous success over the years and deserves praise for the effectiveness and straightforwardness of its services. It has earned the trust of millions of customers and the number is increasing each day. You can access redBus discount coupons from HappySale.in too! With a vast selection of coupons for redBus, you can save a lot of money on booking your tickets using your trustworthy ticket-booking platform. Pay through Paytm wallet and get the best discounts on your bus ticket bookings. 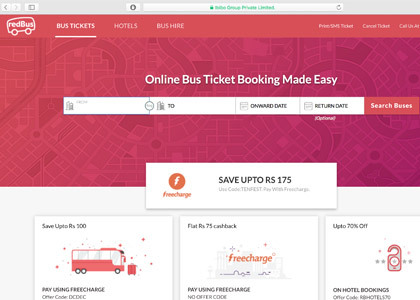 Freecharge Wallet offer gives flat Rs 75 cashback on all the bus ticket bookings. Get cashback on your bus booking through ICICI net banking, credit or debit card payments.